Okay, so a product I am going to be reviewing (SOON!) for the TOS Homeschool Crew is from one of my very favorite homeschool companies -- All About Learning. We've used All About Spelling since before it was called that (!) and I've blogged about that, oh, a few times now. I'm pretty sure that the above picture shows basically what I'm supposed to be getting. 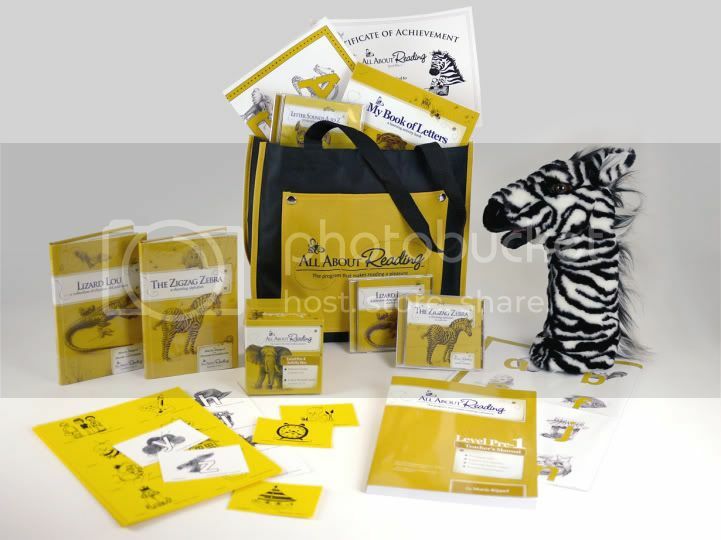 The description of what we are supposed to receive said, "The Teacher's Manual, the child's workbook, 2 alphabet charts, a Reading Activity Box with Picture Cards and Letter Sound Cards, CD Rom, Puppet, two readers, two audio books and a Tote Bag." From what I've seen, Level 1 is supposed to be out in April-ish or May-ish. I can't imagine I'll end up with the opportunity to review that (I wish!)... so after we get going with this, I'll have to decide what I want to do after All About Reading Pre-Level 1. I don't think Trina is going to be spending a lot of time at this level, but I do know she needs work on some of the skills covered. What kinds of products are singing their siren songs to you this year? Institute for Excellence in Writing has a new program for littles: The Primary Arts of Language. (I'll link it better when it is up online!) There is both a Reading set, and a Writing set. And I want both. The reading uses poetry (yes!) and teaches phonics and whole words. Games, farm stickers, letter stories... what's not to love? Trina fell in love with the picture of the farm stickers. I suspect Richard would love the poetry aspect and be willing to do it alongside her. And I wonder if my bigger two would go through it quickly. Not sure. The package includes a teacher's manual, a DVD-ROM which includes video and four MP3 audios (two of which I own and love), a student book, games, and a farm folder and stickers. The writing package focuses on printing, copy work and composition. It also includes spelling (using All About Spelling... you know, the program I called practically perfect!) I wouldn't get the whole package, since I own AAS already. 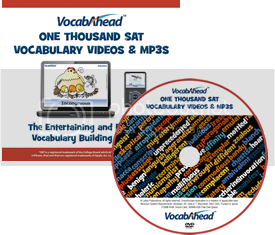 But it includes a teacher's manual, a DVD-ROM (with video and two audio MP3s), and some additional MP3 audio downloads. I've got the additional mp3s in my cart right now. If they took Paypal, I'd have bought 'em already. I love, love, love how IEW puts so much emphasis on teaching the teacher. I love how they make programs that can be used by a big family. I want this. I really want this. And I haven't really even seen it. <sigh> Monday... there is supposed to be samples and more information online on Monday. And, I'm supposed to get to see it at a homeschool conference in a couple of weeks. The other thing calling to me relates to a review we are doing right now. I was introduced to See The Light when I won a Christmas DVD of theirs. My kids -- especially Thomas -- LOVE the DVD. And I just this week received the first DVD in their Art Class series. Oh, wow. Love this. Just love it. I like a combination of art instruction and art history that doesn't take much effort from me, and that my kids find entertaining... and possible to do. I'm not sure I can work it into my budget, but wow, I sure want to. A guest post from my daughter. Trina (age 5) decided yesterday that it was critically important that she come up with step by step instructions for making a PB&J. I just had to blog it. I'm trying to make the punctuation reflect how she said it all. First, you must obtain permission. If you are a kid. This is critical. Next, you get out the bread. Don't smush it. Next, then, you get out the peanut butter. Crunchy or creamy, your choice. Next, then, you get a knife and a spoon. Next, then, you get out the jelly. Make sure it isn't runny jelly, that's for pancakes. Did I already get the silverware? Yes? Okay then. Okay, so you take out two pieces of bread. And you close the bag. People will get mad if you don't close the bag. First you put jelly on one piece of bread. That's what the spoon is for. Then you put peanut butter on the other piece. That's why I told you to get out a knife. Do NOT lick the spoon or the peanut butter from the knife. If you do, Mom <eye roll> will lecture you about bacteria and stuff and it will take a lot longer to finish your sandwich. So don't do it. Where was I? Oh, yeah. Then you just put the pieces of bread together. With the stuff on the inside, of course. And cut it if you want to. I just eat it like this. One Race, One Blood by Ken Ham and Charles Ware was a pretty quick read, once I sat down to actually read it. 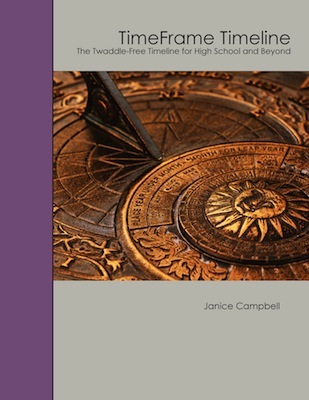 The book itself is 163 pages, with a lot more in the appendices. It is a rarely discussed fact of history that the premise of Darwinian evolution has been deeply rooted in the worst racist ideology since its inception. This significant book gives a thorough account of the effects of evolution on the history of the United States, including slavery and the Civil rights movement, and goes beyond to show the global harvest of death and tragedy that still finds its roots in Darwin’s destructive writings. • Eye-opening discussion on racism and its roots in the hearts and minds of millions still today. Within these compelling pages, Dr. A. Charles Ware, president of Crossroads Bible College, and Ken Ham, president of Answers in Genesis examine the historical roots of racism that have permeated evolutionary thought, and the Bible’s response to this disturbing issue. This is a crucial and timely study that profoundly addresses the Christian worldview regarding “race” from a compassionate and uniquely compelling perspective. A lot of this information was not new for me, which probably helped make it a quick read. If you haven't read/seen other materials on evolution and racism and on the biblical view of races, you might need more time to ponder the content. What I loved about this book was the final two chapters -- Grace Relations and New Seeds -- written by Charles Ware, which talk about what we as a church need to be doing. Those were the chapters that made me think. And for me, those are the chapters that make this a book to own. One aspect I liked was the idea that as Christians we need to ban the term "race" from our vocabulary and start seeing past the little surface differences between people. It made me laugh, though, as I thought about how difficult that is. Even if we really want to. It seems like everything, everywhere is constantly trying to split people up and categorize us all by what shade of brown we are. And if you can't tell by the photos on this blog, I'm one of the people who has had all of the melatonin-producing genes bred out of me. Except for the freckles. Okay, I just can't... I simply cannot go on. I'm going to cry. I know this is petty and stupid and not a big deal in the grand scheme of things. But this IS the straw. That last one. I cannot take it. The question this week: What do your children want to be when they grow up and what are you doing to help them pursue their field of interest? I've talked a lot about what my kids are thinking right now for careers... they pretty much all lean towards science of some sort. 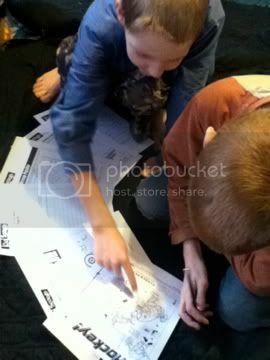 Thomas wants to be an archaeologist, Connor leans towards forensics. William changes his mind all the time. Richard wants to work at UL testing products. Trina, well, although she seems so grown up as a 5 year old, still, she IS only five. So this post is about my boys, mostly the three who are in double digits. That means we've tried to make science and math pretty important in our schooling, while still focusing on communication and just being well-rounded. I want them to be able to get into a good college, if that is what they want to do. But maybe it is because I have this song going through my head this week... I guess I've been wondering about how we're doing in preparing them to "grow up to be a man." Okay, you're back. The Beach Boys are often blown off as being just fluff, feel-good, and fun... and I do think that is true of some of their music. But this song gave me something to think about. Oh, ouch. They start their count-up at fourteen. Yikes. Connor will be fourteen in about two months. I'm not always willing to think that this count-up has really started in earnest. What is kind of funny is some of the conversations that were held (not instigated by me) in this house this week. Brought on by Valentine's Day, no doubt. Dale giving them advice about finding a woman worth marrying. And how much there really is to the statement about how behind every great man is a great woman. Not sure what that has to do with this topic... but in thinking about preparing them for their futures as men, what is more important than finding someone who respects them, who honors them, who supports them? And really, the question about their kids sounds a lot like a respect thing too. Will I be the kind of man my kids are going to respect? Maybe it is the influence of Blue & Gold this weekend, but the other thing I keep thinking is that one of the reasons we invest so much in Scouting is that we feel that Scouting is helping us to encourage our boys in what WE want them to be when they grow up. Men of honor, men of faith, men of courage, men of principle. And I don't have to ever teach about maggots helping to determine time of death for them to "be" those things. This post took a completely different direction than I expected when I first read the topic. But I think what we are doing to help our children pursue their fields of interest has far more to do with what we are doing to encourage character than it has to do with what we are doing to teach to their interests. Okay, I meant to post last night, but I was just too stinkin' tired. So I'm posting today instead. Unfortunately, we didn't get as many photos as I would have liked. For those of my readers who aren't into the whole Scouting thing, Blue & Gold is a bit of a birthday party for Cub Scouts. It is the annual event where typically a lot of the kids are awarded their ranks. 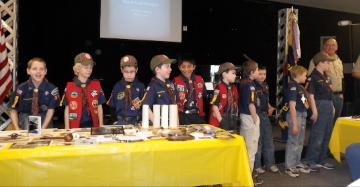 This year, our pack chose to incorporate the Arrow of Light ceremony into the Blue & Gold Banquet, which makes for a very long ceremony, and I'm afraid by that time, most people were no longer really paying attention to those Webelos II kids and all that they had accomplished. 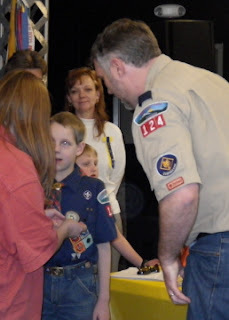 We went as a family -- all of us -- with two Cub Scouts, and the two Boy Scouts were part of the crossover ceremony. We listened to a fascinating speech made by a woman whose father was involved in Scouting for 75 years, nearly from the beginning. It was pretty amazing to hear her tell stories of her father learning from a Civil War veteran. I had a little girl begging me to take her to the bathroom at that point, so I'm a bit fuzzy on just WHAT he was learning. The Tigers were the first den to be recognized. Unfortunately, my den has one requirement remaining before earning their Tiger badge, and there were only two kids at Blue & Gold. Those two, however, were awarded a fistful of progress towards rank beads, and a Map & Compass Belt Loop. They worked up through the dens until they got to the Webelos I. Here's the whole group of 'em... Thomas is on the end. 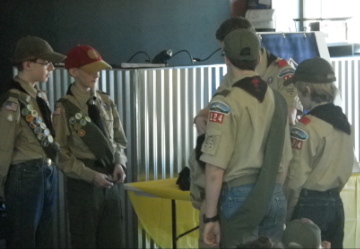 Initially, the kids were awarded activity badges and belt loops and the like. 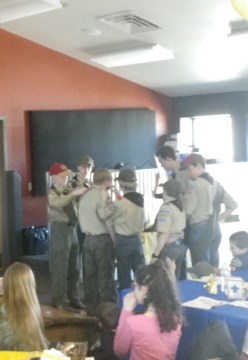 Then a smaller group was awarded their Webelos badge. Here I am pinning a badge on Thomas. He actually earned it back in December, so it is the special 2010 edition of the badge. or just a hassle and not fun. So when I had the chance to review an online Spanish program for little kids, I was very interested. Speekee is a video-based immersion course. All the speaking is in Spanish, starting from the first video (English subtitles are available). There are a total of ten videos, each 15-20 minutes long, and they are FUN! Richard and Trina were the ones primarily watching this, and I have to say that Trina loved it more than her brother. The basic idea is that you watch a video (we watched it several times over a week or so) and you interact with the puppets (including Speekee) when directed. You watch several children doing various things. And there is one main grown-up (Jim) who models correct conversation with Speekee. Everyone involved on-screen is a native Spanish speaker, and the locations are Spanish as well. 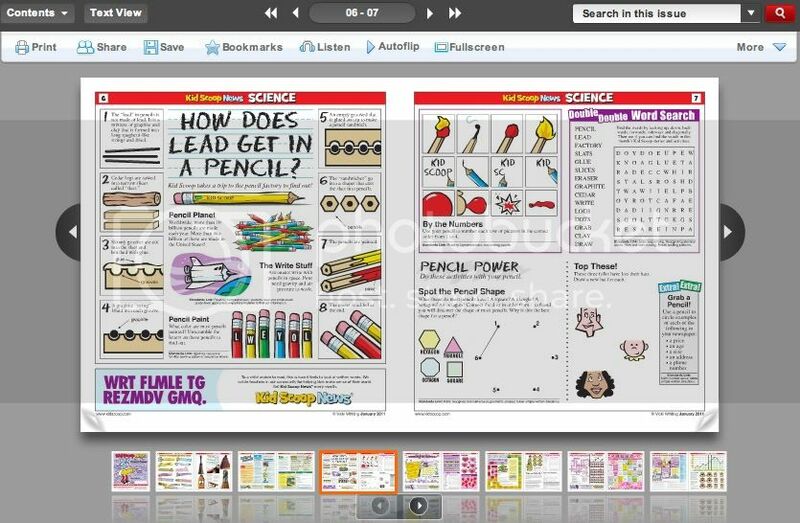 In addition to the video, there are some worksheets that can be printed, and some suggested activities. And -- if your house is anything like mine -- the songs will be sung over and over outside of "class time" which further reinforces the Spanish. My perspective: The kids were absolutely adorable, and most spoke fairly slowly and deliberately, which was perfect for this kind of a show. The songs were catchy. It felt a lot like watching Sesame Street sometimes, in that "clearly this is meant to appeal to the kids" kind of a way. I learned (or re-learned) a fair amount of conversational Spanish though. One thing that was really fun? 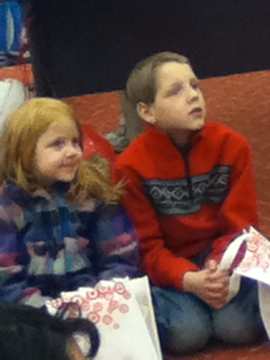 The kids were given Toy Story 3, which we had not seen, during the review period. For those of you who aren't familiar with the movie, one thing that ends up happening is that the toys have to reset Buzz... and they accidentally reset him in "Spanish Mode." That whole scene is fabulous, but the point: Richard and Trina actually understood a fair amount of what "Spanish Buzz" said! Not all of it, but a surprising amount. I love that you can get this as a monthly subscription for only $7.50 per month. No commitments, cancel any time. So you could subscribe for a month or two for a really reasonable price. Trina, age 4, absolutely adored this. She begged to watch it, and she begged to re-watch episodes. 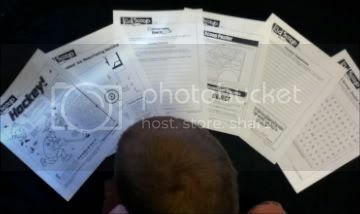 She really didn't like the worksheets, so I didn't have her do much (if anything) with them. Richard, age 6, liked it. But he was totally content to watch a video once and not see it again. 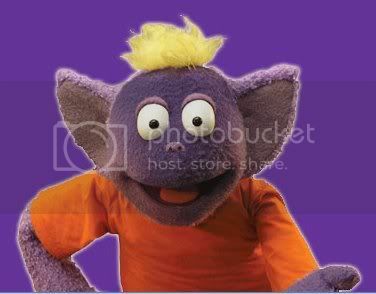 He didn't beg to "do Speekee" like his sister. But he didn't complain either. And he clearly learned a fair amount of Spanish. Thomas, age 10, didn't really watch on a regular basis, but what he did see, he thought was incredibly dumb. He confessed that some of the songs were "okay, I guess" and that they did help him to internalize some Spanish. 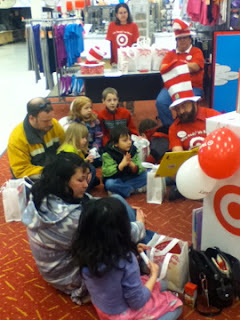 But he was not willing to be a participant as such (I left it TOTALLY optional for the big kids). William, age 12, and Connor, age 13, pretty much shared an opinion. They thought it was silly and kind of fun. They both commented on being impressed with how much Spanish they could fit into these segments, especially given that everything is repeated so much. And they thought it was a great way to do a language program for younger kids. They were both (Connor moreso than William) willing to sit with the little two for the videos, and they were both able to then encourage the younger ones in their Spanish use. Disclaimer: As part of the TOS Homeschool Review Crew, I did receive complimentary access to the Speekee program. The fact that I received complimentary products does not guarantee a favorable review. It does guarantee a review. A fair review. But I am not going to praise something unless I think it deserves the praise. If I don't like it, you'll hear that. And hopefully with enough detail as to why so you can decide for yourself if what I hate about it makes it perfect for your family. For more about my take on reviews, visit my blog post here. So, if after reading my review, you thought... I should check this book out... well, here is your opportunity. Courtesy of the LitFuse Blog Tour, I have an additional copy of this book to give away. 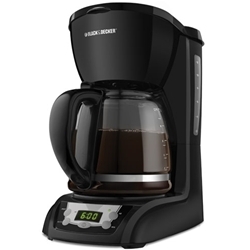 Mandatory entry: Leave a comment on my review, and come back here and tell me you want to be entered to win! Follow me via Google Friend Connect, or Networked Blogs, or both. One entry for each. Post about this on your blog, Facebook, or somewhere. Then comment here, with a link if appropriate. Okay, technical stuff... This giveaway will close around midnight MST on my birthday next Thursday. 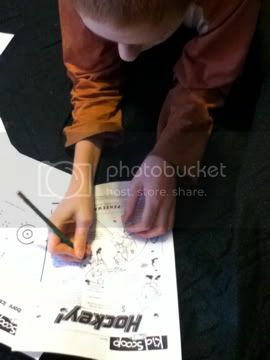 I'll draw a winner via random.org on Feb. 25, and if I am unable to reach them, I reserve the right to draw another name. I think I'll be able to get to a post office on Saturday the 26th, so it ought to ship then. Thanks to LitFuse and MomLifeToday for this giveaway!! 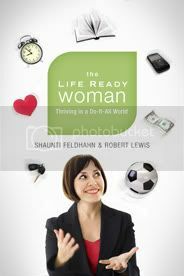 As part of the LitFuse Blog Tour, I had the opportunity to read Life Ready Woman by Shaunti Feldhahn and Robert Lewis. I wasn't quite sure what to expect, but I've heard Shaunti speak and was interested in reading the book based on that. "Are you a ‘Doing it all’ or ‘Do what matters’ woman? God has given every wonderfully unique woman different skills and abilities, different desires, and different temperaments -- and every woman around the planet and through the ages is certainly living in different circumstances. But no matter what a woman’s life looks like, the Bible says that God has an individual mission and plan that He’s carefully designed for each of us. And He wants us to find it. Starting January 2011, The Life Ready Woman and the Life Ready Woman Video Series will help every wonderfully unique woman to thrive as she identifies and courageously pursues God's unique design and callings for her. LifeReady Woman puts you on a roadmap to make decisions that will lead to relief, delight, and fulfillment instead of regret." The book is split into two parts. The first is "God's Purposes and Plans for All of Us." Here, the authors lay out exactly that -- a Biblical Blueprint of what we as women were made for and what we were made to do. For instance, she talks about the "be fruitful and multiply" in a way that isn't just a "breed like rabbits" mentality. It's far more than just having kids, it is raising the next generation up... oh, let me quote the book... "Each of us is called to be a part of raising up and launching a healthy next generation that will glorify God and bear His image throughout the world." That "each of us" is male and female, by the way. This section took me awhile to get through, because I found myself arguing with the author about the interpretation of certain things. Overall, though, I tended to agree with most of it, at least once I actually finally read through it. I think most everyone is going to find something in this section to be uncomfortable with. The second part is about figuring out what the first part means to YOU, and working through God's plan on a personal level. This is the part of the book that makes you think. The part of the book that made me think. The part I am still thinking about, to be honest. If you are interested in winning a copy, read on... or go check my Giveaway post! Or better yet, do both! This week's Blog Cruise topic: How are your spouse, grandparents, or other family members involved in your homeschooling? Most people seem to be posting about their wonderfully involved husbands, or active grandparents. I'm struggling with what to say, and am tempted to not post. But I guess I am going to go ahead anyway and at least write this. We'll see if I post. The kids' grandparents are not really involved in their homeschooling. All are supportive. But we live a thousand miles away, which makes it difficult to be involved in any real day-to-day stuff. Same for the kids' uncles and aunt. When we visit home, or someone comes out here, some school will frequently happen. And grandparents have purchased "school stuff" as gifts, especially science-y stuff, or great children's books. As we are approaching studying the 20th century again, I'm sure the kids are going to be conversing with grandparents about various events. I remember last time we studied 20th century history, the kids had a long conversation about some "I Like Ike" buttons with their grandma. I can see things getting a lot more in-depth this time around. The Vietnam War ought to lead to an interesting conversation with Grandpa. Watergate, the Carter malaise... I know I look forward to doing a multi-generation conversation about some of that. Dale's primary role in our homeschool is to work long and hard so that I can stay home to teach. He is also pretty good at laying down the law when bad attitudes prevail. He has listened to a number of audiobooks during his commute that we are listening to during the school day so that he can be a part of discussions involving the book. He has recommended some audiobooks that neither the kids nor I would have found on our own. He is always up for watching a movie based in the time period we are studying and is able to discuss those as well. Sometimes, he will listen to a kid read. And if I'm totally pulling my hair out because we have a math concept that just won't sink in for a child, he'll try working through it. By that time, the child involved has probably heard the same concept presented in 4-5 different ways, and very, very often it will just "click" when Dale goes over it. That frustrates me, selfishly... like I'm a horrible teacher and it was so effortless for Dale. But the relief of kiddo finally grasping it generally outweighs the annoyance that Dale didn't have to see firsthand how frustrating it had been. He's also quite willing to figure out a way to get an iPod or other gadget when he knows it would make life a bit easier for me, or for the kids. Check out the TOS Crew Blog on Tuesday for more ideas as to how real families are involving adults besides Mom in their schools... I know I'll be looking for ideas! I recently received a package from Progresso soup and MyBlogSpark that included five cans of Progresso Light Soup, a yoga mat, water bottle, exercise bands, sports headband and wristband. This is all a part of their Souper You Debut promotion where they are giving away a New York makeover. Check out their Facebook page to enter! Progresso now has 40 different soups with 100 or fewer calories. I love having something around that I can throw together for a quick Low-Cal lunch. And with varieties that include New England Clam Chowder and Zesty Santa Fe Style Chicken, it is never plain and boring. And this isn't part of the Progresso Light line, but we have a new family favorite: Albondigas (Meatball and Rice). Mmmmm. This is something we can definitely do on a regular basis. Chipotle. Jalepenos. Oh, yeah, that works here. And with recent sales and coupons (such as this one), we have stocked up. Would you like the chance to try some of these too? Progresso and MyBlogSpark have generously given me the chance to give away another workout pack with a coupon for free Progresso soup to one of my lucky readers. Mandatory entry: Check out the Progresso website, and post a comment telling me which soup variety you think you would get with the coupon. Entries will be accepted through midnight MDT on February 21. I will use random.org to draw a winner sometime on Washington's Birthday. If I cannot figure out how to contact you, or you do not respond within 48 hours, I will draw a new winner. Disclosure: Progresso and MyBlogSpark provided me with the free prize pack, and the gift pack to give away. No other compensation was received, and I was not required to write a review, much less a positive one. I'm too scattered for a real post, so some things that have happened here lately, with links to people more coherent than I am. And maybe even a picture or two. Of course, it doesn't help that we started working through Greek Alphabet Code Cracker either. Poor kid. My itty-bitty Tiger den is so cute. We're not going to make it to earning the Tiger badge by Blue & Gold (next weekend) because we are short one activity. We're currently voting -- everyone took forever to get back to us, so we ended up with three parents arranging for three separate opportunities -- do we go to see the newspaper down at Fort Carson? Or do a tv station tour? Or tour the local Christian radio station? Decisions, decisions, decisions... Waiting to hear if any of the proposed days do NOT work, and then we'll make a decision. But we did go to the Pioneer Museum yesterday. I have lived here for over sixteen years, this museum is FREE, and I have never been to it. Right now, they have a WWII POW exhibit going, in addition to all the cool stuff they usually have. I would have loved to have spent more time in that. Two six year old boys, though, well -- they had other ideas (only half the den was able to attend). This picture is of Richard and D goofing off. None of the serious pictures really worked. In their laps are the scavenger hunt sheets -- we went through the museum trying to find the items listed. We only really needed help with one that we just couldn't locate. The kids were given great bookmarks as prizes -- one says "I love history" and the other had something to do with history as well. 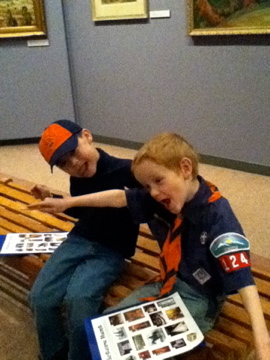 Oh, in addition to going to the museum yesterday morning, my two boy scouts were participating in an Eagle Court of Honor. This mom is who I want to be when I grow up, I'm telling you. But I will never, ever have the attention to detail required to pull off such coordinated events. Ever. Anyway, this is the second of their boys to make Eagle, and it was so much fun to be there. Even with a pipe bursting before the ceremony -- so mostly dads got that cleaned up, water shut off, bathrooms blocked off... so it didn't go without a hitch, but close. William got through his reading. I was glad of that. I thought he'd freeze up. 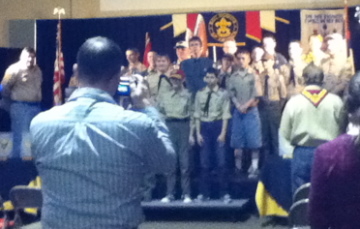 The picture is pretty lousy though -- but this was at the end where they recognized all the scouts in the troop and how a young man doesn't make Eagle without a strong troop behind him. One huge upside to this is that Connor talked with a couple of the assistant scoutmasters about his road to Eagle... and since this mom is sick of him having five Eagle-required merit badges partially completed with him putting NO effort into any of them at the moment, that bit of news was wonderful. I know he could knock out two of them if he spent about an hour and a half getting things together and just *met* with his merit badge counselor. The other three would take a bit more effort. I have the world's greatest library, I'm telling you. We missed the bookmobile last week due to snow (it left early!) so I didn't see that it is time, once again, for the 7th Annual Adult Reading Program. 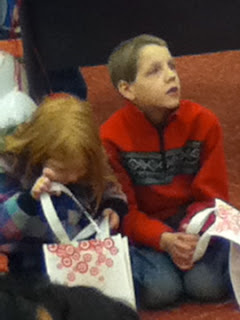 I mean really, why should the kids be the only ones getting prizes from the library. I adore my Reading Program mugs... can't wait to get a couple more this year! And reading 8 books by April 4 gets us another prize and an entry into the grand prize drawing. Anyway, I am going to track my reading on my blog. Just because. I lose those silly forms, so this way, I can store it away, and only pull it out to update it before I take it in. The Stones Cry Out by Sibella Giorello. Feb 10, I think. Fabulous book. Seek Me With All Your Heart by Beth Wiseman. Feb. 16-17. Reviewed here. In the Shadow of Evil by Robin Caroll. Feb 23. Reviewed here. A Trail of Ink by Mel Starr. Feb 23-24. Reviewed here. 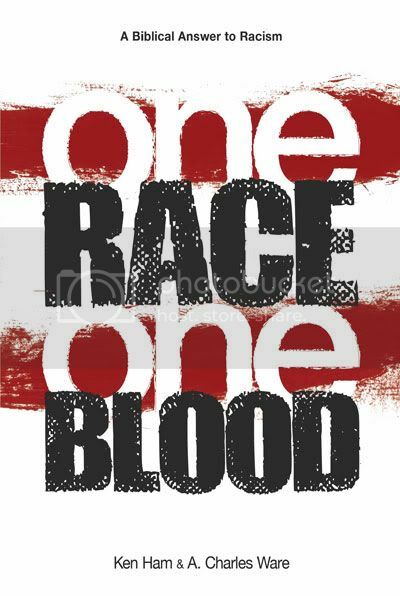 One Race, One Blood by Ken Ham & Charles Ware. Feb. 9-24. Reviewed here. Demolishing Contradictions, edited by Ken Ham. Feb. 24-25. Reviewed here. The Mountains Bow Down by Sibella Giorello. March 1-2. Watch for a review later this month. Without going into a lot of detail, I'm questioning if I don't suffer from a reasonably mild case of SAD, or if it is just the normal seasonal cycle exaggerated a bit in my case. I'm looking into some things I can do to deal with my lethargy. I'm behind in my Bible in 90 Days readings, and I have to work at catching up. And I need to get in touch with my little group. Tomorrow is a big scout day. Richard has a Tiger den outing, and Connor and William are participating in an Eagle ceremony for a very wonderful young man. I hate having only one computer that the kids can use for school. Hate it. We are loving Illuminations 2. Watching Drive-Thru History right now as a supplement. Oh, and absolutely loving Sonlight Core 7. Murder for Her Majesty, of course, turned into a family read-aloud. I should know better than to think I could read a book to just Connor. Speaking of things turning into family projects... Connor insisted on being let in to our time with Apologia's Who Is God? book. And both Connor and William insisted on participating with Thomas in Earth: Its Structure and Its Changes. Why do I even try to have them do their own thing?